Medellín es la ciudad de la eterna primavera (Medellin is the City of Eternal Spring). This Colombian city is a fascinating place to explore. One of the best ways to learn about Medellín is on one of the daily free walking tours led by Real City Tours. Some highlights of the tour. “The best way to get to know Medellín is on a free walking tour with Real City Tours. The tour starts near City Hall, where you can see the Monumento a la Raza. This twisting sculpture tells the story of the state of Antioquia. Next, check out Plaza Cisneros, also known as Parque de Las Luces. From there, the group heads to the Palacio Nacional. It’s actually just a big market, but it’s a cool building with a lot of history. The streets are bustling with activity here in El Centro. There are plenty of opportunities to try local drinks and snacks – jugo fresco .. buñuelos … and of course, empanadas. Walk by the Iglesia de la Veracruz and keep winding your way through the busy streets until you see the tallest building in the city – Edificio Coltejer. 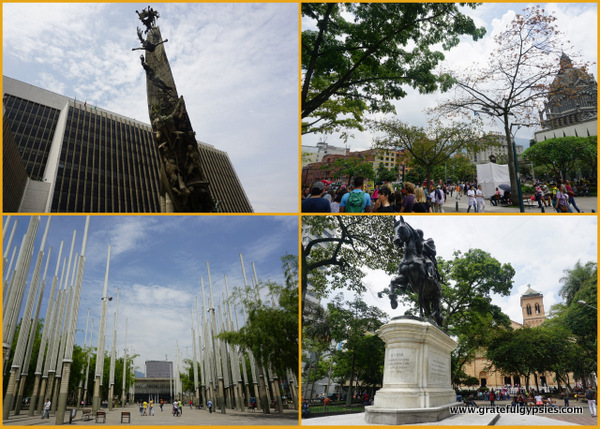 Plaza Botero is filled with statues made by the famous artist who was born right here in Medellín . Here you’ll see the Palacio de la Cultura. On a walk through Parque Bolivar, you’ll hear locals jamming out. Finally, you get a glimpse into the city’s street art scene on a walk through Parque San Antonio. You’ll learn a bit about the dark history of this park through two sculptures of birds by Botero.